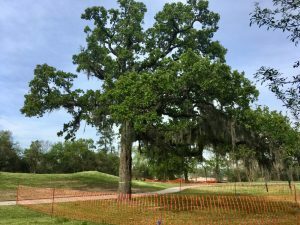 Beautiful Oaks Doomed on Memorial Park Golf Course? Are Big Trees Part of Massive Tree Felling Project in Public Park? Updated April 3, 2019: The trees are to be saved. The Parks Department finally responded with an email Wednesday morning, April 3. “In response to your question, the fencing is to protect the trees and not cut them down,” wrote Estella Espinosa, communications manager for the Houston Parks and Recreation Department. 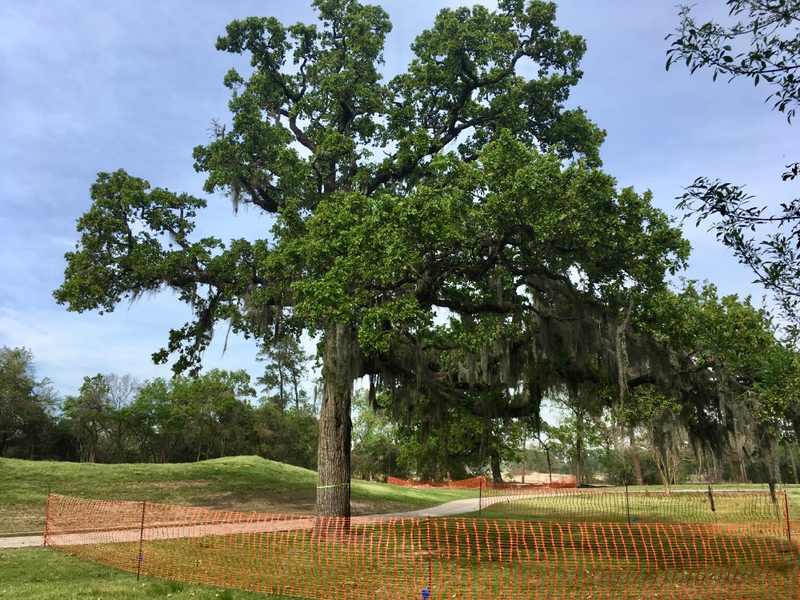 Strolling along Memorial Drive past the fence obscuring the secret remodel of the public golf course in Houston’s Memorial Park, we noticed these lovely old oaks tagged with ties and surrounded by plastic fencing. We were alarmed. 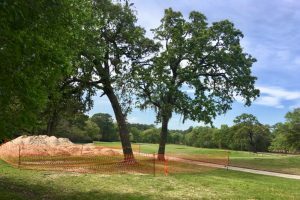 Hundreds of other trees, including mature oaks and pines, are marked for felling with plastic ribbons all over the 1500-acre park, which has already lost innumerable trees as the $200-300 million Master Plan is bulldozed into place. But these trees were on the golf course. Could it be they were marked for preservation? Other trees already have been felled as part of the controversial $13.5 million “upgrade” of the popular course into a PGA Tour tournament-level course. We’ve contacted the Memorial Park Conservancy, the private nonprofit that raises funds and manages the park for the benefit of the people of Houston. We’ll have an answer soon, we hope. Update: Representatives of the Conservancy have responded that the renovation of the golf course for PGA Tour tournaments is the responsibility of the City of Houston Parks and Recreation Department and that we should ask HPARD about the trees. So we sent an email about the trees to HPARD Director Steve Wright late on Thursday, March 21, and we are waiting for a reply. Update March 28: Still no word from the Houston Parks Department. Looking like the trees are doomed. I’m truly hoping these are marked to SAVE! Too many trees lost during Hurricanes and trees are so important for the environment. I hope these trees will stay. There is absolutely no reason to spend money to remove these trees. Please follow the article in the Houston Chronicle today, “Scale Back Plans for Development of Memorial Park”. Yes, we hope the trees will stay too. Let the Memorial Park Conservancy and your City Council representative know what you think. Thank you for recommending the editorial by our founding board president, Frank Smith.